For EasyWorship users, Nursery and Message alerts are a great way to get someone’s attention with little to no distraction to others. The Nursery Alert is designed to give you a way to notify parents that they are needed in the nursery. With EasyWorship, the nursery worker can notify the person running EasyWorship and they will display the predetermined number that matches the child to the parent on the screen. When the parent sees their number on the screen, they can calmly remove themselves from the service and make their way to the nursery. 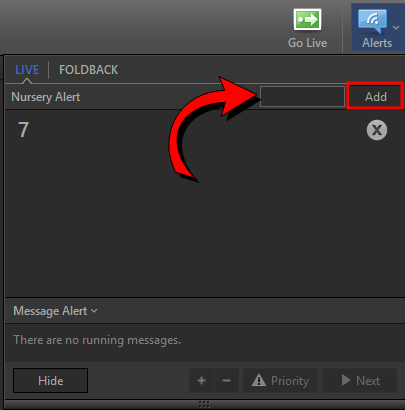 To use nursery alerts, click Alerts in the toolbar, enter the alert message, and click Add. To delete the alert, click the X next to the alert in the Alerts window. You can modify the appearance of the alert by clicking Edit > Options… and selecting the Alerts tab. Message alerts can be used for any text message you want to convey to your congregation. This can be messages from notifying someone they left the lights on in their car to posting an announcement like, ‘Church banquet, Wednesday evening @ 7pm’. And, it can be sent as a simple message made up on the spot, or you can create templates for messages used often or to create things like countdown clocks. If you choose to add a simple message alert, the New simple message alert window will appear. Enter the desired message and click OK. 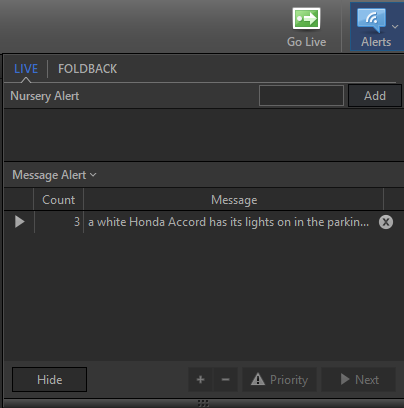 The message will immediately display to your live output and be listed in the Message Alert area of the Alerts window. The scrolling message alert will automatically display 3 times. You can add or subtract the number of times the message displays by clicking the plus or minus button. To immediately stop the alert from displaying, click Hide. If there are multiple message alerts, you can select one and click Priority to display only that alert. You can click Next to advance to the next alert in the list. In addition to creating a simple message alert, you can create an alert template for alerts you will use over and over again. Click Alerts, then Message Alerts > Create/Edit alert template… The Live Alert Editor appears. To add a new alert template, click the Add icon in the left pane. The Edit Alert window will appear. Foldback alerts will work the same way as your Live Message alerts, but they will show only on the Foldback screen if you are using Foldback. If you don’t have Foldback enabled in EasyWorship, you will not have an option for a Foldback Message alert. A token is essentially a variable that you can insert into an alert. 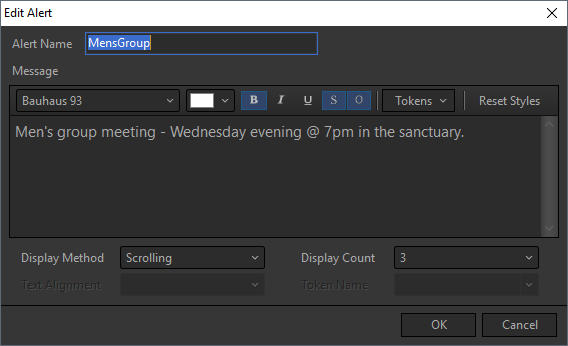 To create a new token, click Alerts>Message Alerts>Create/Edit Alert Template. Add or Edit an alert and click the Tokens drop-down and select Add. The Add/Edit Token window will appear. Enter a name for the new token. Select the type of token from the Type drop-down. Depending on the type chosen, other fields will appear in the window as shown in the table below. For the “countdown” tokens, an Allow Overrun check box will appear. Check this box to have the countdown clock start counting with a negative time to show that you have overrun the start time. 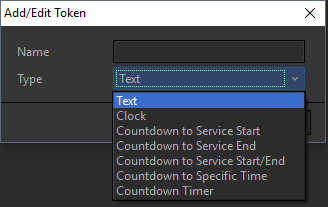 The following is a guide to the different types of clocks and text you can use for your Tokens. For the Service Start and Service End clocks, you will need to set Service Interval times in EasyWorship under Edit > Options > Service Intervals. Text No additional fields. Enter the text to display in the alert. into the alert, using the format chosen in the Format field. field appears.Enter the desired format. Service Intervals tab of the Options window. greater of 1/3 service interval length or 15 minutes. Visit our Alerts Video or Help Article for more information about Alerts.